Japanese sports apparel brand may not be as popular as other brands in India, but once you try their merch, you’ll pledge your loyalty forever. Noosa, Kayano, Quantum or Nimbus, whatever the cool name, there’s a shoe at Asics to fall in love with. While they’ve got their technology on point for comfort and performance, it’s their design that’s winning brownie points for us. A far cry from solid colours or even a dual-tone pair of trainers, Asics go all out with the palette. Nothing like running in shoes that sport every colour on the rainbow. In fact, I’m just waiting for the month’s salary to come in before I get myself a Gel Noosa Tri. 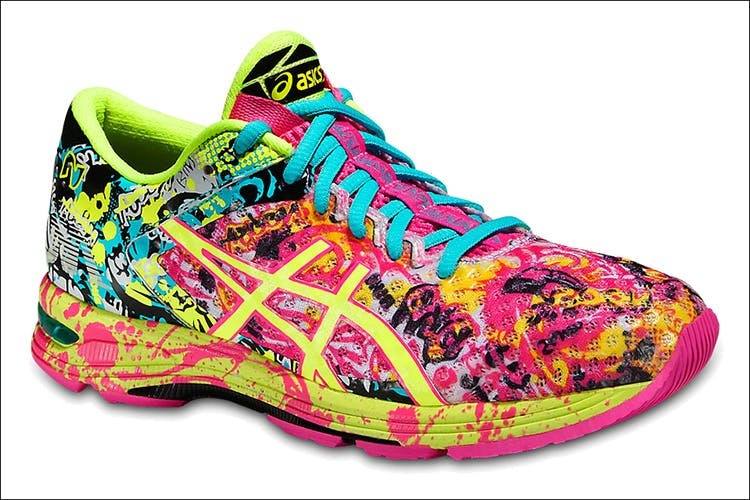 Psychedelic, bright and with graffiti-like patterns, it’s a proper style statement on track or treadmill. With funky designs for both men and women, training, running and tennis-specific shoes are currently on offer in India in the sports department. If you’re looking for a wardrobe upgrade too, this store will sort you out with everything from tights and tracks to breathable jackets and shorts. All with the trademark graphic prints and jazzy colours. What? We like looking bold in a drab gym, OK? Not quite a sporty person but love the aesthetics of the brand? Fear not! Naturally Asics also has a lifestyle collection, and it’s called Tiger. While it’s not available in-stores, Jabong.com currently stocks all Asics Tiger merch. So while you’re buying yourself those casual sneakers with nubuck leather uppers, feel free to order the LBB Team some too. We rather like the whole collection. Especially the pastel range of high-back ones for ladies. Now go on, get your look sorted. The inspiration to workout will follow automatically.